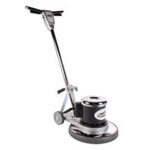 Low speed floor buffers are great machines to scrub your hard floor and carpeted surfaces. The low speeds are ideal for tough scrubbing jobs that require a more aggressive scrubbing pad or floor scrubbing brush. On the small end we have some great 12 inch floor buffers and 13 inch floor buffing machines which are appropriate for smaller areas and overall smaller jobs. Most jobs do well with one of our 15 inch floor scrubber buffers or 17 inch 175 RPM floor polishers/buffers but if you have a really big floor cleaning job on a regular basis than one of our 20 inch floor scrubbing machines might be more appropriate for your situation.